The Tribhuvan International Airport that had remained closed after an aircraft skidded off the runaway during landing has come back to operation. Normal operation of domestic and international flights has resumed after a disruption of almost 12 hours, TIA General Manager Raj Kumar Chettri said. The Yeti airlines aircraft that slipped to the grassy field adjoining the runaway has been removed to the parking lot. 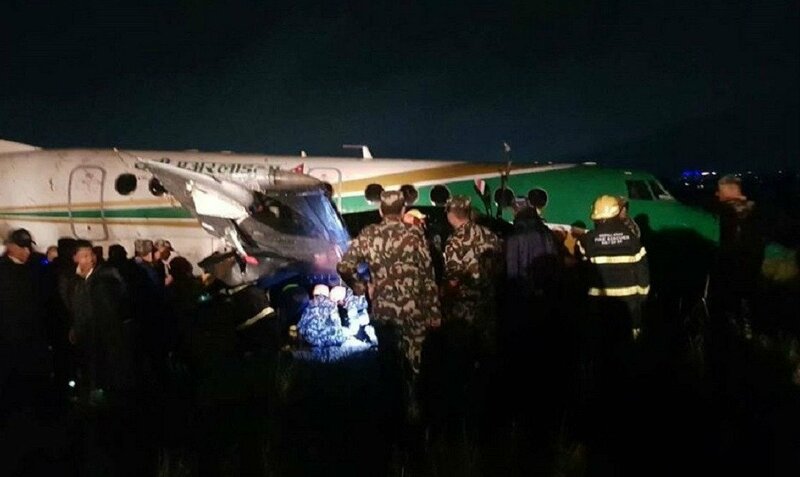 The aircraft with call sign 9NAHW was carrying 21 passengers from Nepalgunj to Kathmandu when the mishap took place at 8:30 yesterday evening. No human casualty took place in the incident that however led to closure of the airport, forcing in-bound aircraft to be diverted to New Delhi, Dhaka and Lucknow. After skidding off the runaway, the aircraft had reached the grassy field nearby. Aviation officials and Yeti airlines technicians worked together with the security personnel and firefighters to drag back the aircraft to the runaway, and then to parking lot, according to TIA general manager Chettri.